“We could use some more loyalty, I’ll tell you that.” Donald Trump proclaimed to 40,000 people in attendance at the Boy Scouts of America’s National Jamboree. While many felt the politicizing of an event for the youth was inappropriate, it was one of the subtler jabs President Trump has thrown towards Jeff Sessions this week. Now the job may be up for grabs entirely. According to reports, President Trump may be considering former New York City Mayor Rudolph Giuliani as a potential replacement for Sessions. Donald Trump says he wants loyalty. In February 2016, Jeff Sessions was the first senator to come out in support of Donald Trump’s presidential bid. For a senator who was already widely criticized outside of his home state of Alabama for charges of racism, discrimination, and voter suppression; many considered a Trump endorsement political suicide at the time. Sessions however, was rewarded for his early loyalty with the office of Attorney General when Trump came into the presidency. Fast forward to July 2017 — Trump is down playing that crucial endorsement and publicly questioning his Attorney General’s competency and loyalty. “I think that’s a bad thing not for the president, but for the presidency. I think it’s unfair to the presidency,” Trump said to the media pool Tuesday morning in reference to Jeff Sessions recusing himself from the ongoing Russia investigation. Trump has doubled down on the criticism of one of his strongest allies and many are questioning his strategy of publicly criticizing a figure who represents the values of the conservative base that helped launch Trump into the White House. Afterall, as Attorney General, Jeff Sessions is one of the few people in Washington who have actually been effective in executing Trump’s agenda. An agenda which basically boils down to doing the exact opposite of everything President Barack Obama did. Less than year into the office, so far Sessions has reversed many of Obama’s criminal justice reforms. He reinstated the federal use of privately owned prisons, attempted to impede police reform in Baltimore, encouraged harsher penalties for first-time nonviolent drug offenders, and is reportedly establishing DOJ task force to crack down on the use of marijuana. Sessions has also won support from Trump voters through his targeting of undocumented immigrants and sanctuary cities. Not to mention his support for voter suppression laws. So why would Trump risk alienating a major portion of his base? All signs point to Robert Mueller and the Russian Investigation. The minute Jeff Sessions recused himself from anything Russia related, he paved the way for the appointment of Robert Mueller and the special counsel. A counsel that undoubtedly keeps President Trump up at night. This recusal obviously frustrates Trump enough to warrant a tweetstorm, the president’s weapon of choice. Yet Sessions has made no indications that he will resign from the post. Meanwhile, Rudy Giuliani is deflecting any reports about him potentially replacing Sessions as AG. The former mayor defended the recusal to CNN on Monday saying Sessions “made the right decision under the rules of the Justice Department” and touted his friendship with Sessions when TMZ pressed him on potentially accepting the job. So for now it appears that Sessions will remain in his position, and continue to enact policies that put minorities and people of color at risk. But would Rudy Giuliani be much of an upgrade from Jeff Sessions? Both men were ahead of the pack in terms of early support for Trump’s presidency. Both men’s ideology align with the anti criminal justice reform agenda already set in motion. Giuliani’s history with discriminatory practices like “stop and frisk” are well documented. 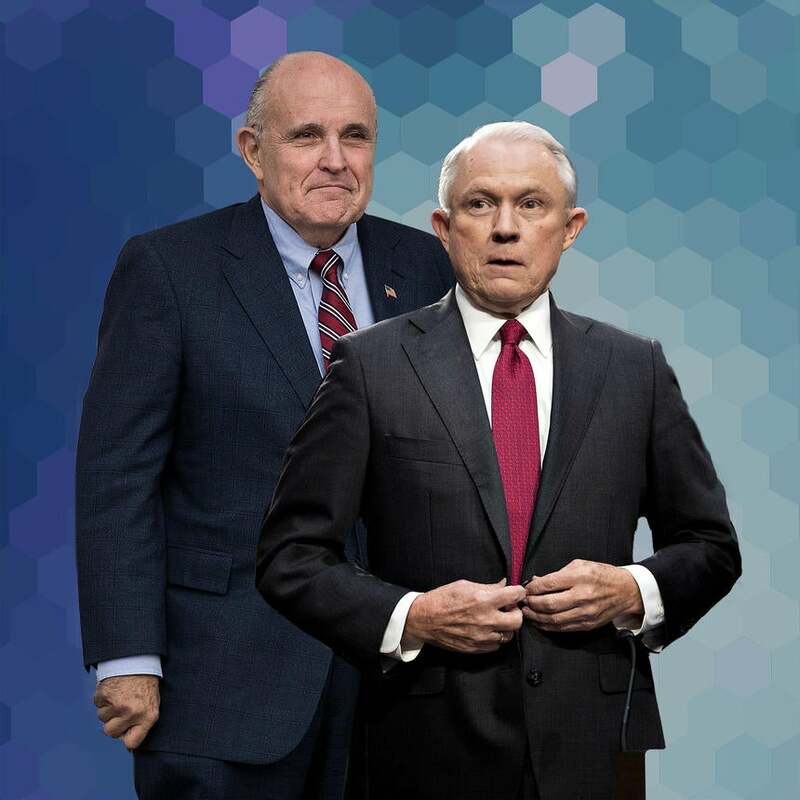 Seemingly, the only advantage President Trump would have if he decided to replace Giuliani with Sessions would be an Attorney General who is not recused from the Russian probe. This would afford Trump more power to influence this investigation and could ultimately lead to the firing of Robert Mueller. Trump cannot directly fire Mueller, but history has a way of repeating itself. When Archibald Cox was named special prosecutor during the Watergate Investigation, President Nixon pressured then Attorney General Elliot Richardson to fire Cox. Elliot Richardson and the deputy Attorney General William Ruckelshaus chose to resign rather than willfully obstruct justice to appease President Nixon. This went on to be known as the “Saturday Night Massacre.” If Donald Trump decides that Robert Mueller’s investigation is becoming too much of a thorn in his side, how long until we see a Trump Administration 2017 remix of the Saturday Night Massacre?